The purpose of this study was to produce activated carbons (ACs) from chickpea (Cicer arietinum) husks by chemical activation (KOH and K2CO3) and to examine their feasibility in removing heavy metals from aqueous solutions. In the case of KOH impregnation with a ratio of 50 wt%, the most developed porosity was achieved, with a BET surface area of 2082 m2/g and a total pore volume of 1.07 cm3/g. By using the product, the maximum adsorption capacities were found to be 135.8, 59.6, and 56.2 mg/g for Pb(II), Cr(VI), and Cu(II), respectively. The experimental data were analyzed by various adsorption isotherm and kinetic models. Thermodynamic parameters such as ΔG°, ΔH°, and ΔS° were also calculated. 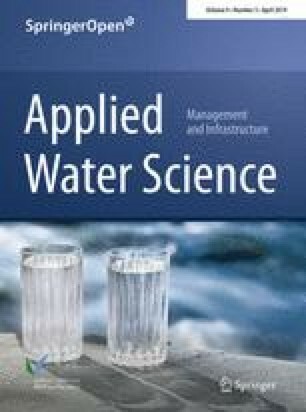 The results obtained in this study shows that adsorption onto chickpea-husk-derived activated carbon was endothermic and spontaneous for the removal of heavy metals from aqueous solutions. Heavy metal contamination is actually a global problem, since metal ions cannot be biologically degraded to less toxic products and persists in the environment (Vassileva et al. 2013; Abdulrazak et al. 2017). Besides, these ions are toxic and hazardous to human health, since they affect human life via bioconcentration, bioaccumulation, and biomagnification in the food chain. Therefore, the treatment of heavy-metal-contaminated wastewaters is of a great importance (Hussain et al. 2017a, b; Rio and Martin 2012; Kaur et al. 2013). Considering the high discharge amounts of metals from industries like electroplating, mining, metallurgy, paint, ceramic, threats to ecosystems have gained considerable importance (Shu et al. 2016; Ramesh et al. 2012; Malik et al. 2017). Several methods have been developed for heavy metal removal such as chemical precipitation, filtration, electrochemical treatment, membrane separation, solvent extraction, and ion exchange (Ahmady-Asbchin et al. 2009; Al-Ghamdi et al. 2013; Rana et al. 2004; Ramana et al. 2010). Unfortunately, high installation and operating costs, the formation of secondary sludge, and incomplete removal of metal ions restrict the practical applications of many of them (Agarwal and Singh 2017; Hussain et al. 2017a, b). On the other hand, the adsorption process has been found to be superior to other techniques in terms of cost, efficiency, the simplicity of design, and ease of operation. There have been a variety of sorbents used in adsorption of metal ions such as agro-based materials, clays, limestones, zeolites, fly ash, activated sludges, polymeric adsorbents, nanosized materials, and their various modified forms (Sdiri and Higashi 2013; Farnane et al. 2017; Bestawy et al. 2013; Hossain et al. 2014; Zhang and Zhu 2015; Omar 2015; Taamneh and Sharadqah 2016; Han et al. 2017). But activated carbon (AC) is still one of the well-known and widely used effective adsorbents at industrial scale due to its large surface area and high adsorption capacity. Hence, its requirement is expected to increase day by day due to the application of increasingly stringent environmental standards and legislation (Thitame and Shukla 2016; Reddy et al. 2014; Pakade et al. 2017). AC can be produced by chemical and physical activation processes. In many cases, chemical activation offers several advantages such as decreasing activation temperature and producing a well-developed porosity by the application of various activating agents. Among the extensively used agents, KOH and K2CO3 have increasingly been used as the activation reagent turning out high specific surface area of the prepared ACs (Deng et al. 2010). Also, it is known that using KOH and K2CO3 results in a high yield and well-developed internal porosity (Abdel-Ghani et al. 2016; Li et al. 2017; Andas and Satar 2018). Commercially available AC is considered expensive for many small-scale industries, and usage of AC may imply regeneration and reactivation procedures. Therefore, interests are focused on to produce AC from abundant, low-cost precursors such as lignocellulosic biomass. For instance, agricultural residues obtained from crops can be considered as promising precursors that can be used in this way. In this study, chickpea husks, an agricultural residue, were used in AC production, since chickpea production has reached large quantities in Turkey. FAO reported Turkey as one of the top producers of chickpeas throughout the world with an annual production rate of 450,000 MT in 2014 (Food and Agriculture Organization of the United Nations, Web site 2016) As a result, considerable amounts of husks are discarded as agricultural waste from the milling of chickpeas, and these by-products have lacked a value-added evaluation method. Hence, the objective of this work is to produce highly porous AC from chickpea husks via chemical activation method and to evaluate it for heavy metal adsorption process in order to enhance the uptake amount of metals. Heavy metal adsorption experiments were performed at different pH, initial metal concentration, AC dosage, temperature, and contact time. Waste chickpea (Cicer arietinum) husk was obtained from mid-Anatolia region. It was dried at room temperature, ground with a high-speed cutting mill and sieved prior to activation. A particle size range between 0.224 and 1.800 mm was used throughout the study. The proximate, ultimate, and structural analysis was performed to identify general characteristics and constituents of the biomaterial. Besides, thermogravimetric analysis (TGA) was performed in order to determine carbonization behavior of chickpea husks using a thermal analyzer (Seteram—LABSYS evo). TGA experiment was performed from room temperature to 1000 °C using a ramping rate of 10 °C/min under continuous N2 flow. AC is prepared by impregnating chickpea husk with ratios of 25, 50, 75, and 100% by KOH and K2CO3 and keeping it in a hot air oven at 85 °C for 72 h after keeping at room temperature for 24 h. The samples of impregnated chickpea husk were placed in a stainless-steel reactor, and the activation temperature was set at 850 °C with a heating rate of 10 °C/min under N2 gas flow (100 cm3/min). The outlet gases were trapped in an ice-cooled bath, and the non-condensable gases were purged from the system. After the activation step, the solid carbonaceous residue is removed from the reactor and is washed with hot distilled water to remove the excess chemicals and dried at 105 °C. Samples are named according to the activating agent and impregnation ratio. For instance, AC1-25 belongs to the AC prepared by K2CO3 activation with an impregnation ratio of 25%, whereas AC2 series denotes impregnation with KOH. ACs are materials having complex porous structures with associated chemical inhomogeneity. Their structural heterogeneity is a result of the existence of a wide pore-size distributions including micropores, mesopores, and macropores of different sizes and shapes. 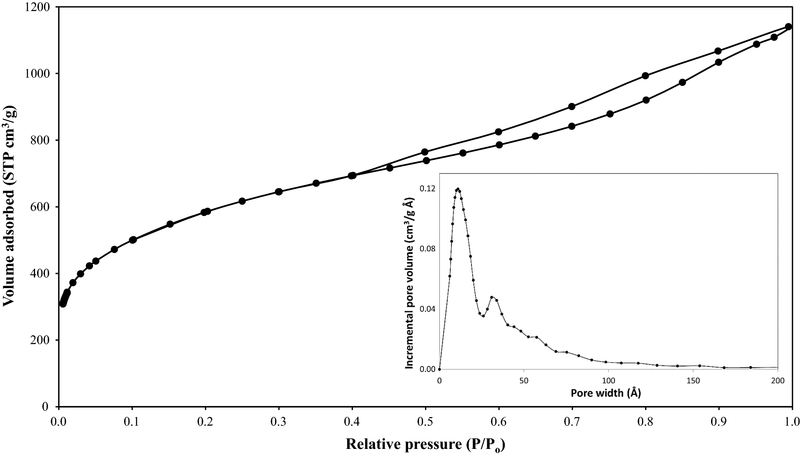 Therefore, pore characteristics of ACs were determined by N2 adsorption at − 196 °C with a surface area and pore-size analyzer (Quantachrome Autosorb) in the first stage of characterization studies. Prior to N2 adsorption, ACs are degassed at 150 °C for at least 12 h. Using BET equation, surface area of the carbons is determined, and the AC with the highest surface area is then characterized by pore-size distribution by quenched solid density functional theory (QSDFT). Elemental composition of products and the raw material were determined by an elemental analyzer (Carlo Erba EA 1108) in order to find out elemental carbon content of the resultant products. Microstructural evaluation of raw material and ACs were done by scanning electron microscopy and energy-dispersive X-ray analysis (SEM–EDX). The morphological changes in the surface due to chemical activation were determined by SEM (Carl Zeiss Evo 50) using secondary electron images. The pH of point of zero charge (pHpzc) of the AC was determined by preparing 50 mL solutions of 0.01 N NaCl at different initial pH values between 2 and 12 by adding 0.01 N NaOH or HCl. An appropriate amount of AC (3 g/L) is added to the solutions and was placed on a shaker for 48 h. Then, final pH of the solutions was measured and pHpzc of AC was noted as the point where pHinitial equals to pHfinal. Boehm titration was also performed to characterize surface chemistry of AC. 0.5 g of AC was placed into a series of flasks which include 50 ml of 0.05 N NaHCO3, Na2CO3, NaOH and HCl. Fourier transform infrared (FTIR) spectrum was collected in order to interpret functional groups of the AC using a Bruker Tensor 27 spectrophotometer. The materials were mixed with KBr powder and processed in pellets. The spectra were recorded in the range of 4000–400 cm−1. where Ci is the initial metal concentration (mg/L), Ce is the equilibrium metal concentration (mg/L), Ct is the metal concentration at time t (mg/L), V is the volume of solution (L), and w is the mass of the AC (g) (Kilic et al. 2011; Mashkoor and Nasar 2019). Adsorption isotherms give qualitative information about the nature of the solute–surface interaction as well as the specific relation between the concentration of adsorbate and its degree of accumulation onto the surface at a specified temperature. For an appropriate design of sorption system, it is required to obtain an optimum correlation for the equilibrium curves, which can be defined as the relationships between the concentrations of the metal adsorbed and metal remaining in the solution at a specific temperature. For equilibrium modeling of the heavy metal adsorption on produced AC, Langmuir, Freundlich, Dubinin–Radushkevich (D-R), and Temkin isotherm models were used in the presented study. where Co is the highest initial adsorbate concentration in the solution (mg/L). The value of RL shows that isotherm shape is either unfavorable (RL > 1), linear (RL = 1), favorable (0 < RL < 1) or irreversible (RL = 0). where KF ((mg/g)(L/mg)1/n) is a constant related with the adsorption capacity and n is an empirical parameter indicating the adsorption intensity. In order to investigate adsorption mechanism and to calculate kinetic parameters, batch adsorption data were also analyzed by pseudo-first-order and pseudo-second-order and intraparticle diffusion and Elovich models. where qe and qt are the adsorption capacity at equilibrium and at time t (min), respectively (mg/g), k1 is the rate constant of pseudo-first-order adsorption (1/min). where k2 is the rate constant of pseudo-second-order adsorption (g/mg min). where kp is the intraparticle diffusion rate constant (mg/g min1/2) and C is the intercept of intraparticle model plot. According to this model, the plot should be linear if intraparticle diffusion is involved in the adsorption process, and if these lines pass through the origin, then intraparticle diffusion is the rate-controlling step. In case the plot does not pass through the origin, some degree of boundary layer control is considered to exist. This indicates that intraparticle diffusion is not the only rate-limiting step, but also other kinetic models may control the rate of adsorption, because of their contribution to the overall transport of sorbate molecules (Chen et al. 2003). In order to understand the effect of temperature and conclude whether the adsorption process is spontaneous or not, thermodynamic parameters such as Gibbs free energy change (ΔG°), enthalpy change (ΔH°), and the entropy change (ΔS°) were used extensively. 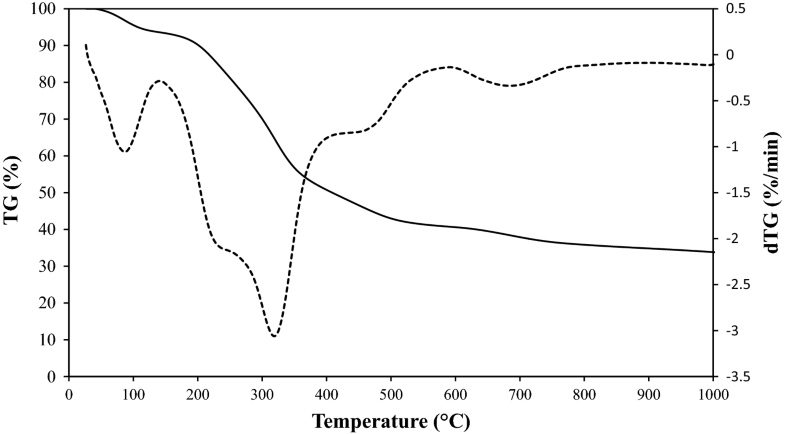 In order to predict degradation behavior of chickpea husk and supply primary data for AC production, thermogravimetric analysis was performed, and results are given in Fig. 1. According to thermogram, thermal decomposition of material starts to be noticeable after about 150 °C and weight loss observed prior to this temperature corresponds to the moisture content of the husk. Main dTG peak around 320 °C indicates the temperature region in which carbonization reactions take place. Between 608 and 770 °C, a reduced loss occurs, and no significant weight loss is observed above this region. Based on the literature survey, main constituents of lignocellulosic biomass (lignin, cellulose, and hemicellulose) degrade over a wide range of temperature. It is believed that hemicellulose degradation starts nearly at 200–260 °C and cellulose degradation occurs at around 240–350 °C due to the evolution of light volatile compounds from the structure. Since lignin is more thermostable than cellulose and hemicellulose, a wider temperature range lasting to 800 °C was expressed (González et al. 2009; Tongpoothorn et al. 2011). Thermal degradation behavior of chickpea husk employed in AC production showed typical characteristics of lignocellulosic biomass samples. According to the TG curve of chickpea husk, the activation temperature is chosen to be 850 °C where decomposition was about to fully completed. Product yield is crucial to determine the feasibility of AC production from a particular material. Therefore, product yields of produced carbons were calculated by dividing the weight of the resulting AC to the weight of chickpea husk used, and results are shown in Fig. 2. The relationship between product yield and impregnation ratio indicates that AC yield decreases with increasing the amount of activating agents at a fixed activation temperature. The effect of impregnation ratio may be attributed to increasing in effectiveness of activation process by the chemical agents due to burn-off. The highest AC yield was produced with an impregnation ratio of 25 wt% as 16.8 and 18.2 wt% for KOH and K2CO3 activation, respectively. Besides, the yields of ACs produced by K2CO3 activation were higher than those produces with KOH activation for all impregnation ratios. Similar results were obtained by several researchers (Ahmed and Theydan 2012; Foo and Hameed 2011), and the differences in product yields were explained due to the ability of KOH to remove more volatile materials during activation. Within the scope of this research, an attempt has been made to produce an AC with good adsorptive properties. As can be understood from the characteristics of raw chickpea husk (Table 1), it can be a good candidate for AC production due to its high carbon and low ash content. AC produced with KOH activation with an impregnation ratio of 50 wt% has the highest BET surface area among the other products and is selected as the adsorbent for heavy metal removal experiments. In the literature, there is only one study on AC production from chickpea husk which was performed by Hayashi et al. (2002). They prepared AC from chickpea husk by K2CO3 activation and obtained highest surface area as 1778 m2/g with an impregnation ratio of 1.0 (100 wt%) and activation temperature of 800 °C. Due to the lack of studies carried on the effect of the chemical agent, KOH activation was performed on the presented study, and it was understood that KOH activation of chickpea husks gives better results than K2CO3 activation in terms of BET surface area (2082 m2/g). The pore characteristics, surface chemistry, and elemental composition of this product are summarized in Table 2. It is also concluded that both activation agent and impregnation ratio effects surface area significantly. 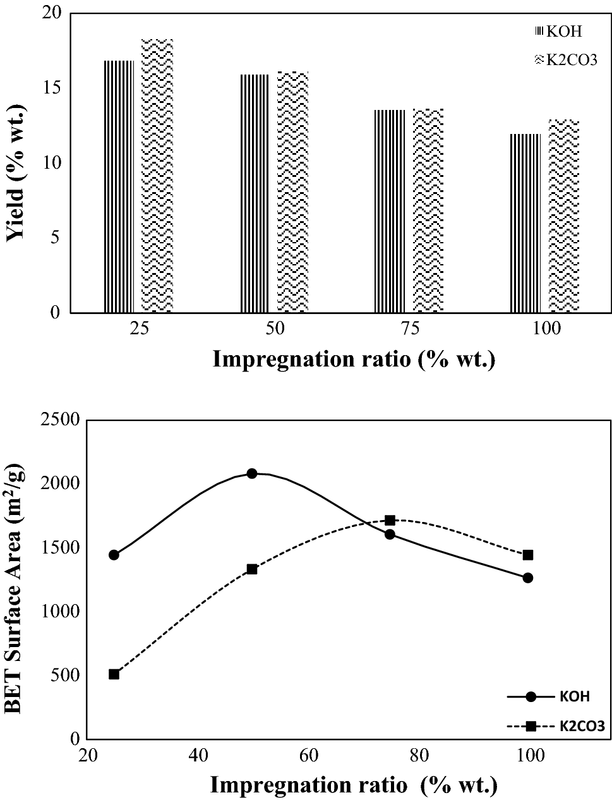 The relationship between impregnation ratio and BET surface area is also investigated and given in Fig. 2. Accordingly, BET surface areas of both KOH and K2CO3 AC’s increased to some extent by increasing impregnation ratio. But BET surface area values are decreased after 50 and 75 wt% for KOH and K2CO3 impregnation, respectively. This may be due to the enhanced activation reactions which cause burn-off of the structure to form larger pores. It is considered that metallic potassium formed during the gasification process would diffuse into the internal carbon matrix and hence widen the existing pores and/or create new pores in the structure. By this way, KOH activation may result in higher surface area than K2CO3 activation because of the quantity of evolved metallic potassium during activation (Ahmed and Theydan 2012). For the sake of comparison, the BET values of some biomass-based AC available in the literature are also given in Table 3. Differences of BET surface areas undoubtedly affected both process conditions employed such as impregnation ratio, activation temperature, and precursor characteristics. As it can be seen, the porous structure of the carbon obtained in this work is compatible with the ACs that were produced with different biomaterials, activating agents, and methods. N2 adsorption–desorption isotherm of KOH AC (AC2-50) is given in Fig. 3 to explain general features of AC. Accordingly, the initial part of the isotherm is of type I with significant uptake at low relative pressures, which corresponds to a microporous structure. At intermediate and high relative pressures, the isotherm shape can be described by type IV with an H4 type of hysteresis loop which indicates the existence of mesopores and slit-shaped pores. To specify the fraction of the surface that an adsorbate molecule can access and cover the surface, pore-size distribution (PSD) of AC was determined by density functional theory (DFT). Since recently developed QSDFT method considers the chemical and geometrical heterogeneity of the pore walls, assuming a structureless, chemically and geometrically smooth surface (Neimark et al. 2009). PSD of AC was determined for slit pore-shaped ACs, and it is also given in Fig. 3. According to the classification of IUPAC, the pores of materials could be classified into micropores (d < 2 nm), mesopores (d = 2–50 nm), and macropores (d > 50 nm). PSD showed that the produced AC had a bimodal PSD which is highly microporous. Also PSD obtained with an actual fitting error of 0.49% indicated the consistency between the gas adsorption data and DFT method. Table 2 also reports detailed pore characteristics of the AC to determine micropore and mesopore distribution. Approximately, the contribution of micropore volume was obtained as 45% of the total pore volume, and average pore radius was found as 10.66 Å.
SEM technique was used to observe the surface morphologies of the chickpea husk and derived ACs. The microstructure of raw chickpea straw, and the resulting KOH and K2CO3 AC are shown in Fig. 4. According to the obtained micrographs, there were significant differences between the surface topography of raw husk and produced carbons. Raw chickpea husk exhibited a non-porous fibrous morphology. On the other hand, ACs prepared with both KOH and K2CO3 have a sponge-like porous structure with interconnected channels. Because activating agents leaving from the structure results in the open spaces that were previously occupied by them. Also, agents decomposing at higher temperatures which in turn cause the burn-off of the carbon structure resulting in a porous texture. Elemental analysis results of ACs showed that carbonization of husks caused increases in elemental carbon contents. Elemental carbon contents were also verified with SEM–EDX analysis (Fig. 5). According to the EDX analysis, KOH AC with the highest surface area had 84.2 wt% carbon and 15.4 oxygen wt% in the structure, while K2CO3 AC had 83.5 wt% and 15.9 wt% carbon and oxygen contents, respectively. Like the textural properties, surface chemistry also affects the applicability of ACs. AC can be defined as a twisted network of defective hexagonal carbon layer planes. These layer planes are cross-linked by aliphatic bridging groups, and heteroatoms on the surface of AC have a significant key role in the surface chemistry by influencing the adsorbent–adsorbate interactions. In order to assess basic and acidic surface functional groups of ACs, Boehm titration is a widely used technique. The acidic groups of AC surface are carboxyl, lactone, hydroxyl, and carbonyl oxygen functionalities, while the postulated basic surface groups are chromene-type structures and pyrone-type oxides (Rakić et al. 2015). pHPZC is also determined for KOH AC and given in Table 2. pHPZC is defined as the pH at which carbon surface has no charge, namely the zeta (ζ) potential is zero. The density of electrical charge is obtained as zero at an approximate pH value of 8 for KOH AC. That means basic surface functional groups are mainly located on the surface of KOH AC. This indicates that the surface groups are mainly related to the impregnation agent and its relative amount. On the other hand, acidic groups of produced AC are mainly carboxylic groups which were 0.4812 meq/g. It is widely accepted that these carboxyl groups are responsible for heavy metal sorption. Since carboxylic groups on the surface of AC promotes an enhanced acidic dissociation and chelating attributes that form complexes of the adsorbed metal and functional groups. The FTIR spectrum of KOH AC and the bands corresponding to the main functional groups are shown in Fig. 6. The broad peak between 3300 and 3400 cm−1 was due to the stretching vibrations of the O–H bonds of water molecules which were adsorbed onto the matrices of the AC. The band around 1100 and 1000 cm−1 was because of C–O stretching vibrations. On the other hand, the band between 1500 and 1600 cm−1 can be ascribed to C=C aromatic ring stretching vibration which can be also observed by the help of a weaker band between 765 and 530 cm−1 (Kılıç et al. 2012; Valizadeh et al. 2016). Produced AC with the highest BET surface area (AC2-50) is used in the adsorption experiments. 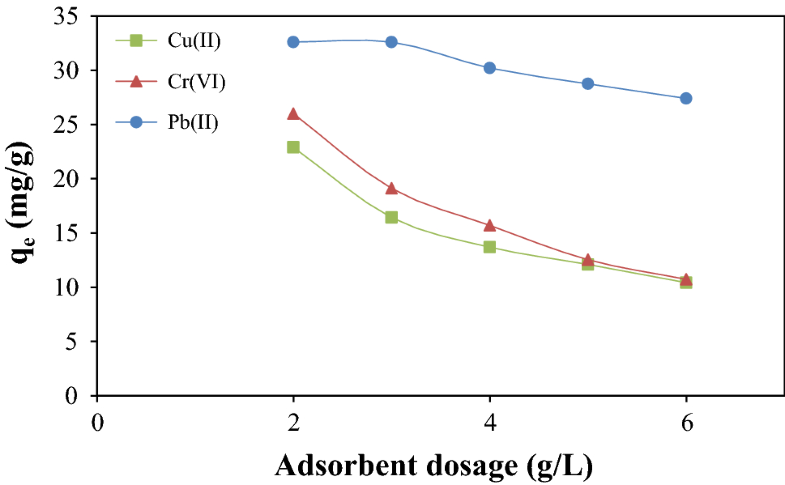 An adsorption study of Pb(II), Cu(II), and Cr(VI) ions was performed by first investigating the effect of different factors such as pH, adsorbent dose, concentration, temperature, and contact time. After that, a systematic data analysis for equilibrium, kinetic, and thermodynamic modeling was carried out in order to determine the feasibility of use of chickpea-husk-derived AC as an adsorbent. In the adsorption of metal ions, hydrogen ion concentration of the solution is an important factor that should be considered. pH affects the solubility of the metal ions in the solution and replaces some of the positive ions found in the active sites and the degree of ionization of the adsorbate. Therefore, the effect of pH was examined from solutions at different pH values ranging from 2 to 10 to obtain maximum removal efficiencies. To optimize pH, adsorbent dose (0.1 grams of AC), initial metal concentration (100 mg/L), and contact time (1 h) parameters are kept constant. The pH value, at which the amount of positive and negative groups is equal, was estimated as the point of zero charge (pHPZC). The pHPZC of AC showed that the surface is positively charged at pH values less than pHPZC and negatively charged at pH values higher pHPZC. The adsorption of cations, such as metal ions, is favored at pH > pHPZC, while the adsorption of anions is favored at pH < pHPZC, due to electrostatic repulsion (Cechinel and de Souza; 2014). As it can be seen from Fig. 7 at lower pH values, there are more protons on the carbon surface that compete with metal ions in the solution. As pH increased Pb(II), Cu(II) and Cr(VI) adsorption was increased until a pH value of 9. 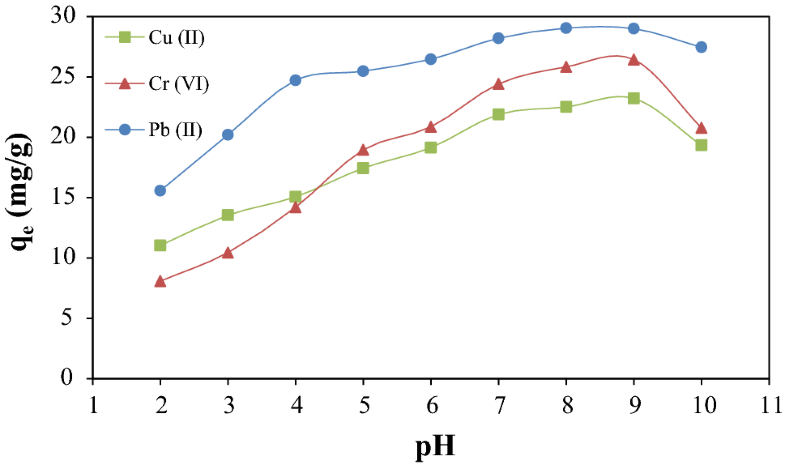 At pH values greater than 9, heavy metal adsorption decreased which may be attributed to the association or dissociation of surface functional groups. Also, increasing pH from 8 to 9 did not considerably changed uptake values, and keeping this in view, the pH values of solutions have been kept constant at a value of 8 in all the subsequent studies. Since adsorbent dosage determines the capacity of an adsorbent for a specified initial concentration of adsorbate, effect of AC amount on heavy metal adsorption is investigated. It is known that as the amount of adsorbent is increased, the adsorption sites remain unsaturated during the adsorption reaction causing to decrease in adsorption capacity (Hameed et al. 2017). But, the aggregation/agglomeration of adsorbent particles at higher dose would cause a decrease in the available surface area and an increase in the diffusional path length. Figure 8 shows the removal of Cu(II), Pb(II), and Cr(VI) as a function of carbon dosage. Increasing carbon dosage resulted in a decline in the amount of adsorbed metal. Optimum adsorbent dosages were determined as 2 g/L for Pb(II), whereas 3 g/L g for Cr(VI) and Cu(II), and these optimum values used at the remaining part of the study. The results of for Pb(II), Cu (II), and Cr(VI) sorption indicate that increase in the concentration of adsorbate increased the amount of metal ion adsorbed per gram of AC. To put it other words, higher concentration implies more metal ions fixed on the surface of the adsorbent (Akpomie et al. 2018). A possible explanation may be that increasing the concentration of metal ions in solution causes an increase in mass transfer due to the increment of driving force for the transportation of ions from solution to the carbon surface (Tan et al. 2016). Figure 9 is used for explaining the contact time and temperature dependency of uptake amounts in the case of 400 mg/L initial metal ion concentration. It is observed from the figure that adsorption was fast as most of the surface of AC was not saturated with metal ions. Hence adsorption rate was fast initially and then slowed down gradually due to saturation. Finally, an equilibrium between adsorbate and adsorbent surface was established after 90 min for Pb(II), Cu(II), and Cr(VI) ions. It is revealed that there was no considerable change after these periods for all initial concentrations. To determine the effect of temperature, the adsorption of Pb(II), Cu(II), and Cr(VI) on AC was also studied at temperatures of 20, 30, and 40 °C, and it is found that the adsorption capacity of ions increased at higher temperatures. Temperature has a slightly increasing effect of adsorption capacity for Cr(VI) and Cu(II) ions. The effect of temperature is much more apparent in the Pb(II) removal curves. These may be attributed to the endothermic nature of adsorption of Pb(II), Cu(II), and Cr(VI) onto chickpea-husk-derived AC as will be further supported by a thermodynamic analysis. At the conditions employed, maximum adsorption capacity obtained at 40 °C, 400 mg/L initial metal concentration and 360 min contact time was found to be 135.8, 59.6, and 56.2 mg/g for Pb(II), Cr(VI), and Cu(II), respectively. In a study that was performed by Alhashimi and Aktas (2017), different types of commercial ACs were performed in order to make a comparison among the different kinds of commercial and produced AC and bio-char samples. Accordingly, adsorption capacity for Cu(II) ions were between 1.8 and 30.1 mg/g, while it was between 4.7 and 53.2 mg/g for Cr(IV). On the other hand, the adsorption capacity of commercial ACs toward to Pb(II) reached higher values up to 81.9 mg/g. By doing a detailed analysis considering both economic and environmental factors together with adsorption capacities, they concluded that engineered AC and bio-char products should be optimized for adsorption applications. The maximum adsorption capacities of chickpea-husk-based AC toward to Pb(II), Cr(VI), and Cu(II) ions show that AC2-50 can provide a potentially replacement of commercial ACs. Sorption equilibria provide fundamental physiochemical data for evaluating the applicability of the sorption process as a unit operation. The performance of produced AC at different temperatures was evaluated by Langmuir, Freundlich, D-R, and Temkin adsorption models and isotherm parameters of models obtained by using nonlinear regression given in Table 4. Among all the models applied, best fitting with the experimental data was obtained by Freundlich adsorption isotherm model which has the highest regression (R2) coefficients. Obtaining best fitting with Freundlich model supports surface heterogeneity of AC and an exponential distribution of the active sites and their energies. The isotherm parameters of n in Freundlich model were found to be greater than 1 which indicates that the adsorption of metal ions onto AC is a favorable process (Kataria and Garg 2018; Wang et al. 2018). KF parameter may also considered as an indicator of the adsorption capacity, and it was found higher in the case of Pb(II) adsorption. According to the Langmuir isotherm parameters, adsorption tendency of Pb(II) ions is found more than Cr(VI) and Cu(II). Adsorption kinetics supply significant information about the reaction pathways and controlling mechanism of adsorption process, which in turn governs mass transfer and the residence time. Kinetic analysis was conducted over a broad temperature and initial metal concentration range, and similar results were obtained. For this reason, kinetic parameters calculated at 20 °C and 400 mg/L initial metal concentration to demonstrate the overall results are reported in Table 5. The conformity between experimental data obtained and the model predicted values was decided according to correlation coefficients (R2). Analysis of the regression coefficients indicated that the pseudo-second-order kinetic model fitted very well with the dynamical behavior for the adsorption of Pb(II), Cu(II), and Cr(VI) ions on chickpea-husk-derived AC under different initial metal ion concentrations. This states that the rate-limiting step on the transportation of metal ions to the solid surface may be chemical sorption rather than diffusion (Abbas et al. 2014; Semerjian 2018). The rate constants for Pb(II), Cr(VI), and Cu(II) adsorption were calculated as 0.0015, 0.0040, and 0.0057 g/mg min, respectively. The thermodynamic parameters of adsorption provide in-depth information about the nature of the process. Therefore, the change in Gibbs free energy (∆G°), enthalpy (∆H°), and entropy (∆S°) values of Pb(II), Cu(II), and Cr(VI) adsorption is given in Table 6. Accordingly, all of the calculated adsorption enthalpies for of Pb(II), Cu(II), and Cr(VI) adsorption are positive, indicating endothermic processes which were also predicted before (Sharma et al. 2019). The endothermic nature of adsorption can be attributed to increase in the mobility of the heavy metal ions and increase in the rate of diffusion of the adsorbate molecules across the external boundary layer and in the internal pores of the adsorbent particle, because of the decrease in the viscosity of the solution. Otherwise, negative ΔG° values show the feasibility and spontaneity of the adsorption process, and the positive ΔS° values show that affinity of metal ions is sufficient to stick on the carbon surface and randomness at the interface of AC–metal solution interphase increased during this process (Li et al. 2016; Enniya et al. 2018). The surface area of the chemically prepared AC from chickpea husk was relatively high, especially for which was prepared by KOH with an impregnation ratio of 50% (2082 m2/g). Pb(II) is preferentially adsorbed on the surface of the KOH AC than Cu(II) and Cr(VI). Comparison of the equilibrium models shows that Freundlich model fits with the experimental data better than other isotherms, which indicates multilayer adsorption. Adsorption kinetics of Pb(II), Cu(II), and Cr(VI) ions was explained with the pseudo-second-order model. The thermodynamic calculations indicated endothermic and spontaneous nature of the metal ions adsorption onto produced AC. As a result, this study represented that agricultural wastes can be converted to effective and low-cost adsorbent materials in an eco-friendly manner since chickpea-husk-derived AC showed a satisfactory adsorption performance due to its high surface area and high adsorption capacity.